Wooden braider, 80mm x 15mm. 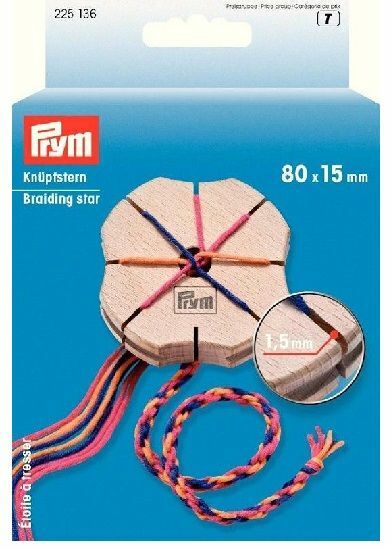 Braiding Star from Prym - This is a cool little gadget to make braids, instead of hand twisting yarn just use 7 stands of double knitting yarn and just fold the yarn over the slots. It is made of wood and has 8 slots and a hole in the middle. it is suitable for yarn around double knitting thickness (3.5mm to 4mm needle size yarn) or thinner. The star is approx 80mm x 15mm. Comes in a box with instructions. Beautiful Pom-Poms made easy! Contains 2 Clover Pom-Pom makers size 2 1/2 inch & 3 3/8 inch (65 & 85 mm) in diameter and instructions. 20 great designs with rubber bands.